Zaino Z-CS Clear Seal is finally here after years in development. 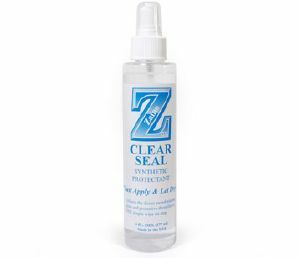 Zaino Z-CS Clear Seal is an advanced total synthetic polymer protectant that is simply wiped on, and that's it! Yes, achieve Zaino award winning gloss and protective durability in ONE simple wipe on step. Wipe on, and walk away, you're done. No buffing. No final wipe down. Simplicity at it's best. Just apply & let dry. Zaino is pioneering the industry with Z-CS, a self curing transparent sealer that doesn't require any buffing or final wiping. Z-CS dries clean and without residue. Use Z-CS on paint, glass, wheels, plastic, or trim for the protection, durability, slickness, and gloss that Zaino is most popular for. All surfaces are protected against potentially damaging exposure to sun or ultra-violet light with our best UV inhibitors. For up to 9 months protection, use Z-CS to top coat Zaino Show Car Polish protectants, or use Z-CS by itself. You can even use Z-CS as a top coat to add high-gloss and improved durability to ANY other manufacturer's product. Z-CS extends the gloss and durability of any previously applied products. Z-CS should never be applied over uncured waxes. Zaino with this product have accomplished the height of product simplicity with a no compromise approach to cutting edge development and industry leading gloss and durability. There simply is not another product like Z-CS in the industry. Less than 1/4 ounce of Z-CS will complete an average sized vehicle. Note: Z-CS should be used very sparingly. Less than 1/4 oz can complete an average vehicle. You will achieve the best results with Z-CS over clean and dry surfaces. Thoroughly clean and dry all surfaces. Mist a cotton or microfibre applicator pad with Z-CS 1 time to preload the pad with product. Do not use an applicator pad that has been used with ANY other product. If you choose to reuse an applicator pad that has already been used with only Z-CS, store it in a sealed Ziploc style bag between uses. Holding sprayer about 4 inches from the surface, lightly spray Z-CS once directly onto the panel, avoiding any overspray. Work Z-CS into the paint evenly with the applicator pad using overlapping motions one section (18-24" area) at a time. Allow product to fully dry. DO NOT BUFF OR WIPE OFF. Sit back and relax while Z-CS does the work! Just apply and let dry! NOTE: Z-CS is extremely durable and should provide up to 9 months of protection for your vehicle. If your goals are maximum shine and maximum protection on everyday vehicles, we recommend 3-4 applications per year. For show car owners, integrating Z-CS with regular use of Z-2 or Z-5 PRO will provide the wettest-looking, deepest, most distortion-free finish you can imagine. For best results, maintain with Z-6 Gloss Enhancer Spray or Z-8 Spray Seal and Z-7 Show Car Wash.